Product prices and availability are accurate as of 2019-03-06 11:04:47 EST and are subject to change. Any price and availability information displayed on http://www.amazon.com/ at the time of purchase will apply to the purchase of this product. Annual. This organic dill is the most widely grown variety. Bouquet dill has early, large seed heads, making it an excellent choice for pickling. Its fresh foliage is wonderful on new potatoes, tomatoes, grilled salmon, spinach, green beans, cucumbers, squash, and lamb chops. The robust, but airy plants reach 30"-36" tall and have 6" wide yellow umbel-shaped flowers. 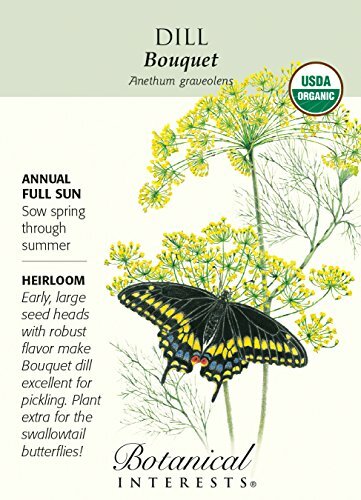 Be sure to plant extra for the Swallowtail butterflies! Their caterpillars love dill (along with parsley, fennel, and carrot foliage).